Commissioned item. Custom designed by Richard Jones Furniture after creating a brief generated through meetings with the clients at which their preferences, needs and budget were aired and discussed. The clients provided clippings of bed styles they liked. They had not been able to find exactly what they were looking for and were seeking an alternative to the mass produced beds they had been offered. Fortunately they were friendly with another of my regular clients and the connection was made. 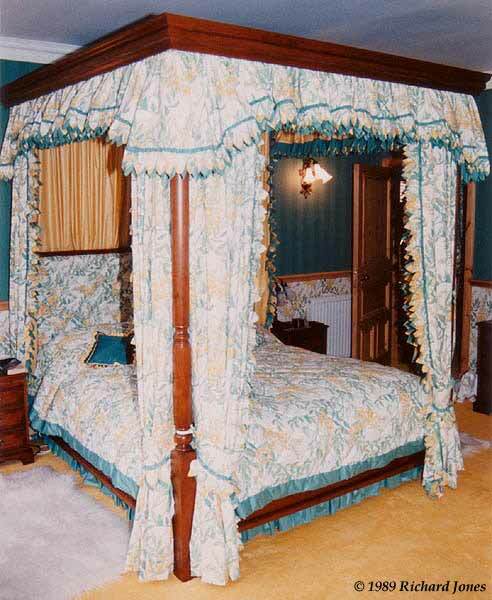 The bed is of course based upon a traditional style, and serves as an example of successfully designing and making a piece to suit the needs of the customer. Materials. All solid wood. American black cherry, lauan secondary wood, dyed, toned and spray lacquered. Guide Price: £4500 to £6500, excluding mattress, bedding and drapes.